RUSH: What do you think, Mr. Snerdley, of Trump jumping all over Bezos and Amazon and the Washington Post and linking them together? Well, now, wait a minute. You say you love this. But I have to tell you, if Barack Hussein O were still president and were — oh, wait a minute. He did. I’m sorry. Silly me. I was gonna say if Barack Hussein Obama was president and singled out an American company or individual, why, there would be hell to pay. And I forgot he did that. It was me, but it was Fox News too. Obama and the left are constantly targeting Fox News and saying Fox News has gotta go, Fox News is horrible, don’t listen to Rush Limbaugh, this is not how thing get done in Washington. And nobody thought there was anything particularly wrong with that. They credited Obama’s cool and the crease in his slacks and all that. 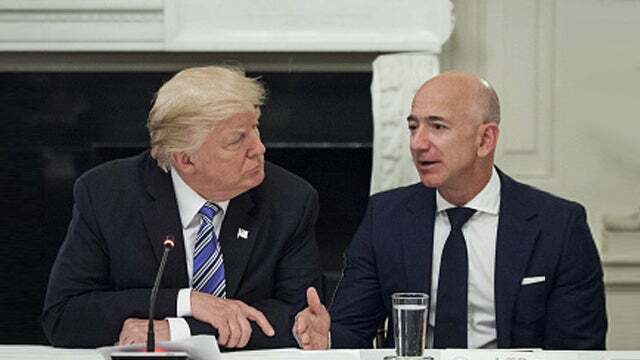 But now Trump is going after Bezos and Amazon, people are outraged. This is not what presidents do. Presidents don’t target individual companies. Presidents don’t target individual citizens. Let me tell you left-wingers, I have been targeted by Bill Clinton, by Hillary Clinton, by Obama and the people on the left for most of the years I’ve been doing this program. And not just targeted, they have tried to discredit me. They’ve tried to destroy this program any number of ways. And there weren’t any concerns about it back then. In fact, the left joined the catcalls, but there weren’t any concerns for our democracy. There weren’t any worries that a powerful president was singling out individual Americans and corporations when Obama was doing it or when Bill Clinton did it. (interruption) What was her law? What was Louise Slaughter — you know, I had forgotten about that. That’s right. Louise Slaughter, she’s at room temperature, right? She passed away. Louise Slaughter, Democrat congresswoman, New York, actually tried to pass a legitimate law called the Hush Rush Law in the House. I had forgotten this. How could I have forgotten this? So it wasn’t just Obama and Clinton, it was the Democrat Congress. And of course Dingy Harry with his Phony Soldiers letter. So all of this idea here that Trump is behaving unlike presidents behave, this is so unbecoming, this is not who we are, these are not our values, this is not our democracy. I don’t recall — and, in fact, when they were coming after me, I don’t recall all that many friends of mine on the right standing up and saying, “This is outrageous. This is unseemly.” There were a few. But not many. Even though I, throughout my stellar busy broadcast career, have always come to the defense of people on our side under unfair assault and attack.